Quietly operating in a corner room in a subterranean lab, a plain-looking piece of machinery is unraveling the mysteries of DNA. It may not immediately draw one’s eye, but this machine is now one of the most powerful tools in the Lorry I. Lokey Science Complex. The tool is a $1 million state-of-the-art Illumina genetic sequencer—the only one of its kind in the state of Oregon—and it is enabling UO scientists to analyze DNA samples at rapid speed and make new discoveries in the life sciences. Those discoveries are among the significant benefits of the recent $10 million gift to the UO from Mary and Tim Boyle, ’71, who pledged the funds last February. In addition to the new sequencer, the Boyles’ gift will provide support for additional instrumentation for the planned renovation of the UO’s Genomics and Cell Characterization Core Facility, where the sequencer is housed, as well as help equip the a new facility for biological imaging. The Boyles’ gift also established an endowment for permanent operational support for the university’s aquatic animal care facility, providing a secure future for this prized research asset. With the exception of colors moving on a monitor, the magic of the new sequencer all happens under the hood. The process can be compared to ripping out all of the pages from a dictionary, analyzing every letter and word on every page, and then putting everything back together in a bound volume, says Doug Turnbull, director of the genomics facility. Researchers use the machine to help answer basic questions about how organisms develop normally and how they respond to mutations caused by disease or their environment. 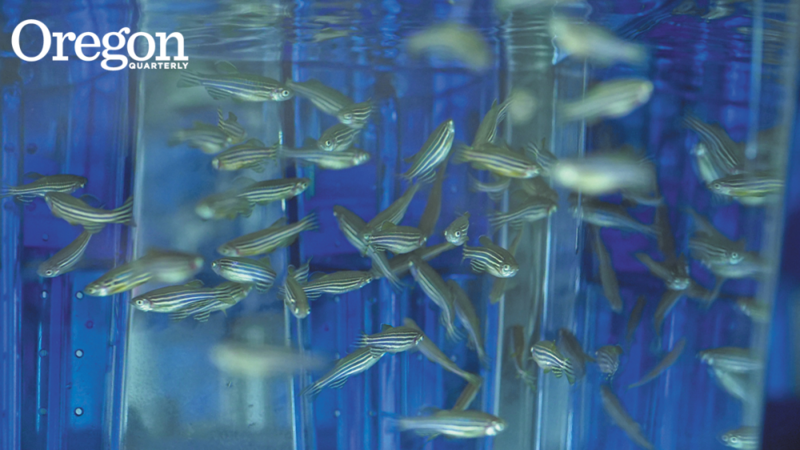 While they use a number of species in their research, including salmon, sticklebacks, and even mosquitoes, the UO’s claim to fame in genetics revolves primarily around the zebrafish, a small tropical fish in the minnow family. These fish are especially useful because at the embryo and hatchling stages they are mostly transparent, offering an easy view of their internal development. 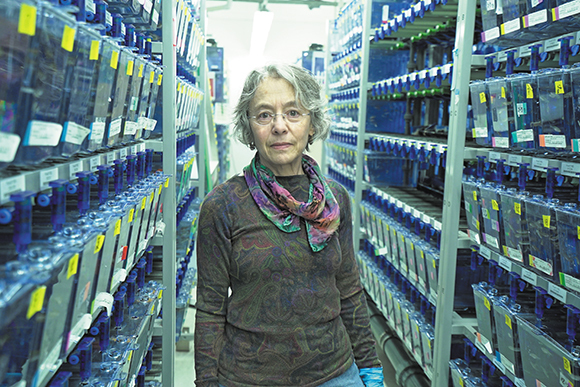 Karen Guillemin, who heads the NIH-funded Microbial Ecology and Theory of Animals Center for Systems Biology at the UO, uses zebrafish to study how microbial communities in the gut (both good and bad) affect developmental processes. “The new sequencer is substantially reducing costs for us to profile bacterial communities of zebrafish, which is extremely exciting for our research program,” she says. 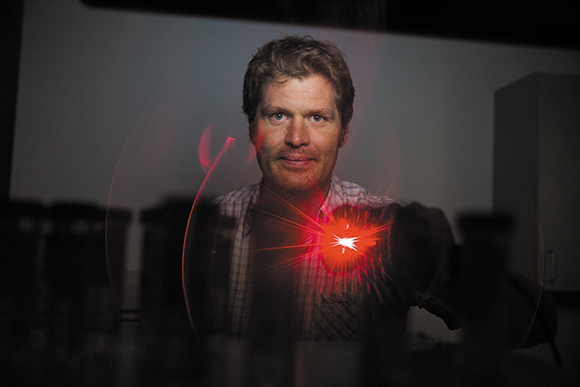 Biologist Phil Washbourne uses them to study how synapses—intricate networks of neurons—pass along information in the brain during development and in diseased states. Breakdowns in these networks are tied to conditions such as autism, schizophrenia, and mental retardation. Washbourne is thrilled to have access to the new sequencer. “The kinds of experiments we are planning have never been attempted,” he says. Outside users from other universities, federal labs, and private companies can also use the equipment under a fee-based arrangement. “Having the UO facility as a DNA-sequencing partner streamlines our business operations and allows Floragenex to focus on serving hundreds of scientists in over 25 countries worldwide,” says Rick Nipper, president and CEO of Floragenex, a UO spinoff that offers sequencing services. Tim Boyle’s aunt, Hildegard Lamfrom, worked in the UO’s Institute of Molecular Biology from 1967 to 1970, a mere fraction of a 40-year career in which she worked alongside a dozen Nobel laureates. Hildegard Lamfrom graduated from Portland’s Grant High School. She earned degrees from Reed College, Oregon State University, and Western Reserve, now known as Case Western Reserve University. “She had a very brilliant career in pure science,” Boyle recalled. In the early 1960s, Lamfrom worked in the United Kingdom with three future Nobel Prize winners—Francis Crick and James Watson, who isolated the double-helix structure of DNA, and Sydney Brenner. She spent time as a scientist in labs in Denmark, India, Los Angeles, and Paris. At Caltech, just before moving to Eugene, she was on the team that found the first evidence for messenger RNA. At the UO, Lamfrom worked with George Streisinger in the Institute of Molecular Biology. She left the UO to work with her friend John Abelson at the University of California, San Diego, on emerging breakthroughs with RNA, or ribonucleic acid. Along the way, she also worked with future Nobel laureates Linus Pauling and Richard Feynman. UO biologist Peter Von Hippel landed at the UO the same year as Lamfrom and Sarabhai. It was a time, he recalled, that Streisinger and Stahl were developing their approaches for studying the genetic code, and when Streisinger was starting to think about cloning zebrafish. Lamfrom, he said, was always very much part of the conversations.